The Walkumentary DVDs are in stock and ready to ship!! This is the original Walkumentary DVD with an updated DVD jacket and disc design. A $5 or > donation covers the cost of replication, packaging and shipping for a DVD*. My Paypal address is listed below or simply click the Donate button if you would like a DVD. DVDs ship out on Tuesday and Friday mornings. *Shipping to countries outside the US costs more so please donate accordingly! The Walkumentary is also available online to stream or to download for FREE. Please note that the online version is low-resolution. Keep The Walkumentary FREE! If you enjoyed The Walkumentary, donations will be greatly appreciated. Thanks for your interest in The Walkumentary … Enjoy the film and TELL YOUR FRIENDS ABOUT IT! On November 6th, 2006, 6 Southbound Continental Divide Trail (CDT) hikers walked up to a humble little barbed-wire fence on the Mexican Border and finished an end-to-end hike that started 5 months earlier at the Canadian Border. Join them on their 2,800-Mile journey hiking the Continental Divide National Scenic Trail southbound thru Montana, Idaho, Wyoming, Colorado and New Mexico. A Note from Disco: One of my goals with this film was to kind of unravel the mystery that is the CDT. I know that when I was finishing up my thru-hike of the Pacific Crest Trail (PCT) in 2004, my fellow hikers were already talking about "doing the CDT" but no one had any real idea of what a CDT hike was all about including myself. I think that video footage goes a long way, even moreso than a trailjournal or slideshow, in showing a hiker what the CDT looks like, sounds like and feels like. Hopefully I captured this in "The Walkumentary." 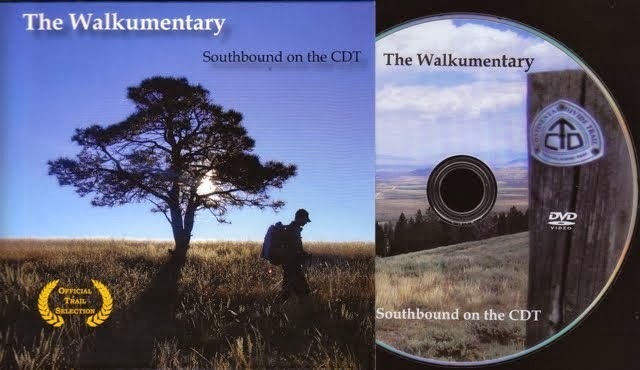 Also worth mentioning is that "The Walkumentary" is the 1st Documentary on a southbound thru-hike of the Continental Divide Trail available on DVD. It was filmed by thru-hikers for thru-hikers . . . or for anyone interested in hiking all or part of the Continental Divide Trail. If you´ve seen The Walkumentary, take a moment to leave a bit of feedback . . . so that others contemplating ordering a copy know what they are getting themselves into!! A documentary about the pain and joy of a five month hike - 2500 miles - from Canada to Mexico on the world’s largest geographic feature: The Continental Divide. This is the full-length trailer for "The Walkumentary" which will be available on DVD for free in May 2007. Follow along as 6 thru-hikers spend 145 days walking from Canada to Mexico on the Continental Divide National Scenic Trail. How I Made The Walkumentary . . .
"My high school video and film students have some questions....camera? batteries? GarageBand? Printed cover?" I posted my response in the "Post Your Own Walkumentary Reviews" thread but will also post it here as a seperate thread in case some folks are interested in this topic. Music Creation: I looped 3 of the tracks together myself on GarageBand 06' and the rest of the music was created by friends including the infamous track "Black Leather" by the amazing Battlecock. Printed Cover: Discmakers.com whom I highly recommend . . . they printed the jackets, the on-disc design and duplicated the DVD's at a great price. External Hard Drive: Lacie 320 Gb Extreme with Triple Interface . . . I basically connected my MiniDV cam directly to my LaCie and then the LaCie to my laptop via a Firewire 400 cable. Let me know if you have any other questions about how I put The Walkumentary together. I´d be happy to help. And a Big Hello to your Film Class! If they have any questions they can e-mail me directly at lawtong@hotmail.com or reply to this thread directly. A freelance writer for Esquire Magazine interviewed me for the October 2007 issue about my southbound hike of the CDT and about The Walkumentary. Well . . . let's just say that the finished article mentioned neither my hike nor The Walkumentary, but it did say that "Expert hikers do it in 145 days" . . . which just so happens to be the amount of time that it took myself, P.O.D. Speedo, Skittles and crew to finish our southbound hikes . . . Umm . . . I'm glad they didn't interview Trauma, Nacho, Pepper, Flyin' Brian or Squeaky for that matter! I presented The Walkmentary at the ALDHA-West Gathering on September 28, 2007 near South Lake Tahoe to a crowd of about 60. Yogi was kind enough to introduce The Walkumentary at the ALDHA-East Gathering on October 7, 2007 in Gettysburg to a crowd of about 100, which happens to be the largest crowd that's seen the movie yet. In April 2007 Gossamer Gear was kind enough to put up a quick mention of The Walkumentary. I used the Gossamer Gear Mariposa backpack during his 2006 CDT southbound thru-hike and absolutely loved it. "Misfit Joe" of 95.9 KZRM-FM Community Radio in Chama, New Mexico interviewed P.O.D. and I during our 2006 southbound hike of the CDT some of which is included in the film. Hear the interview now. BACKPACKER Magazine has joined with the Continental Divide Trail Alliance (CDTA) to give the CDT "an official map." Check out the progress of this undertaking on their blogsite. This BACKPACKER CDT Project blogsite was kind enough to put a blurb up about The Walkumentary. Both Just Tomatoes, etc! and Ursack provided P.O.D. & I with yummy treats and protection for those yummy treats during the hike. And finally . . . Documentarian Scott "Squatch" Herriott answered my countless questions during the editing of this film and without him I would have folded up P.O.D. 's iBook G4 and used it as a Plinko chip. Frankly I owe him my 1st-born although I doubt he really wants a baby from me. Thank you Squatch!